In the Nineteenth century there was a great conflict between cultural ideas and ideals due to fast influence and impact of western thought into the arena of Indian life. The glamour of the western civilization so strongly affected the Indian people that they began to give up their centuries–old indigenous thought, spiritual disciplines, values and culture very rapidly. In fact, it was a hard challenge and struggle for survival in all respects of our Motherland from this mighty on slaught of the western culture. His most illustrious disciple Swami Vivekananda founded Ramakrishna Math & Ramakrishna Mission and its Headquarters at Belur Math, Dist Howrah, West Bengal. 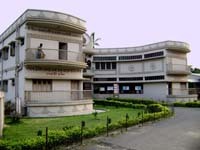 The Kamarpukur centre was affiliated to the Headquarters, Belur Math in 1947. 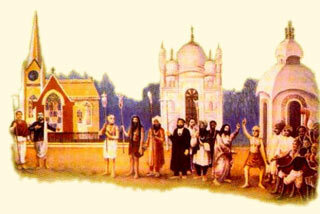 Sri Ramakrishna’s Temple built on the place where he was born. A mud house with thatched roof where Sri. 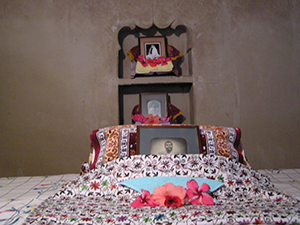 Ramakrishna and Holy Mother Sarada Devi lived. 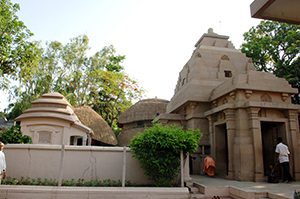 Holy Kamarpukur, Jayrambati and Belur Math, together form the Golden Triangle of pilgrim centres. 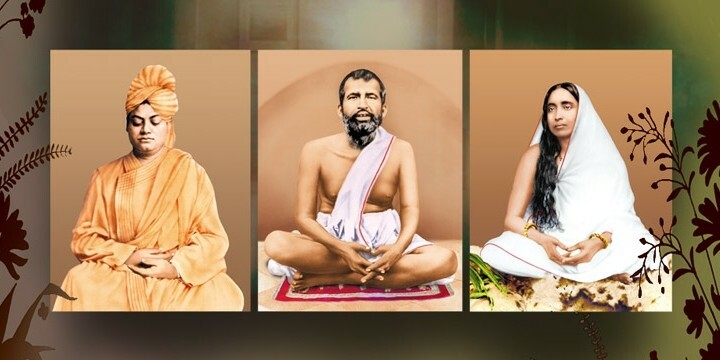 Every devotee or admirer of Sri Ramakrishna aspires to visit these three sacred places at least once in a lifetime to offer homage to the Holy Trio. Besides daily worship, religious discourses inside and outside the Math, spiritual retreats and spiritual counselling by the senior monks, the Centre celebrates birthdays of the Holy Trio and other religious personalities. Sri Durga Puja, Sri Kali Puja, Sri Jagannath Mahaprabhu Rath Festival, Christmas Eve, Shivaratri and other occasions are also observed. On Ekadashi days Ramnam & on Purnima days (full moon) Shyamnam Sankirtan are held. The concluding function of the 150th Birth Anniversary of Swami Vivekananda was observed through various programmes throughout the year with due solemnity and enthusiasm. As a part of four-year-long (2010-2014) service programme founded by the Government of India, being conducted by the Headquarters to commemorate the 150th Birth Anniversary of Swami Vivekananda. Gadadhar Abhyudaya Prakalpa (all-round personality development of Children) was launched at Kamarpukur on 2nd October, 2010, the Birth-day-tithi of Swami Abhedananda. The total number of beneficiaries of this project were 100, where 43 were boys and 57 were girls. Vivekananda Swasthya Pariseva Prakalpa (Community Health Programme) was initiated at Deregram, the ancestral place of Sri Ramakrishna. Under the project, there were 54 boys, 46 girls & 3 aged women beneficiaries. ‘Pallimangal’ is the Bengali word, meant rural welfare. Obviously Ramakrishna Mission Pallimangal, Kamarpukur, Hooghly has been working in villages since its inception for the upliftment of the poor and down-trodden with an emphasis on the women folk through its health, education, economic, social and cultural programmes. Regular Mobile Medical Service is being continued since 1980 in and around the different villages of three Gram Panchayet (GPs) of two districts at free of cost. The mobile medical team is comprised of a general physician, a pharmacist, an assistant, local volunteers and a driver with a Medical Van. At present, three centres have been continued to visit once in a week at Kamarpukur & Balidewanganj in the district of Hooghly & Koalpara in the district of Bankura. We are very happy to let you know that National Blindness Control Programme is being continued for twenty six years at this place. It has been started since 1982 at free of cost. Now, we have established a well-equipped Eye Day Care Centre, through which we have been serving the poor and down-trodden village people of the adjacent areas of four districts e.g. Hooghly, Bankura, Burdwan and West Midnapur at regular basis since May 2006. A good number of eminent ophthalmic surgeons, ophthalmic assistants, physicians, O.T. Sisters, staff, devotees and volunteers have been co-operating us in the programme. Screening for operation IOL, Scanning of eye, Biometry for power testing of IOL, operation itself, refraction, medical treatment, spectacle distribution, health education and referral service, investigation facilities are being provided at our Ramakrishna Mission Charitable Dispensary & Eye Day Care Centre, Kamarpukur. Leprosy was one of the burning public Health Problems in and around the Arambagh Subdivision in West Bengal. A few years back, it was a disputed uncovered area for a long time. This programme had been started since July, 2001 under direct supervision and guidance of State & Dist. 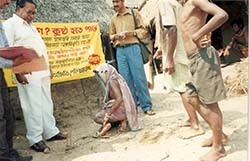 Leprosy Society, in collaboration with German Leprosy Relief Association, in the allotted areas of Goghat-I & II Blocks, Arambagh Block and Arambagh Municipality. The programme was envisaged with general survey, early case detection, diagnosis and MDT treatment, retrieval of the defaulter, interpersonal IEC, Group IEC. Now the scenario of the programme has been changed since 2005. AIDS is one of the major burning public Health Problems in India since recent past. 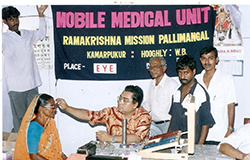 This programme has been started since 2006 in collaboration with German Leprosy Relief Association. The areas have been allotted Goghat-I & II Blocks, Arambagh Block, Arambagh & Tarakeswar Municipality under NACP project. The programme envisages Inter Personal IEC, Group IEC and Health education campaign in the project area. The specific geographical areas have been entrusted to Six Field Workers (PMW), One Supervisor (NMS) and One Doctor. 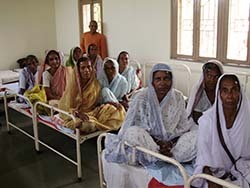 This programme has been started since 2002 in collaboration with CARE India under Scheme II. Now the service is continuing under Scheme IV of RNTCP programme with direct supervision of District and State Govt. Health Department. It is a designated Microscopy and Treatment Centre [DMCTC] under Arambagh TU since 2007. Now this programme is done under DMCTC Scheme. During the year Sputum examination for early detection for suspected cases and the confirmed patients were treated through our treatment centre & referred to the different sub-centre under Arambagh T.U. Our activities of this programme like, DOTS treatment service, follow up the cases, defaulter retrieval, health education to the affected person and his/her family members, Inter Personal IEC, sensitisation of the common people etc. are being continued. Ramakrishna Mission Pallimangal is the wing of integrated rural developmental work of Ramakrishna Mission, Kamarpukur, Hooghly and West Bengal as a whole. 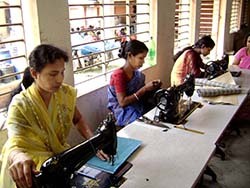 It is running successfully with several rural development programme including soil testing, self-reliance vocational training and production as well as marketing support system in weaving, handicrafts, incense sticks making and food processing with the primary objective of helping the poor and destitute women folk by providing them some opportunities of income generation and thereby improving their economic as well as social status. We are thankful to department of Food Processing Industries, Govt. of West Bengal who have provided fund for cluster development Project for making Ghee and Noodles. Due to the social, economical, environmental and many practical difficulties, a considerable part of our rural population is yet to see the light of education. Pallimangal has been conducting a number of Non-formal Education centres at different villages to provide minimum literacy to those who failed to reach for regular schooling. Books, khata, teaching materials, garments and school bags are distributed to every student during this year. Presently 17 such NFE centres for the backward and depressed classes are being run by Pallimangal in 11 villages under 7 Gram Panchyet areas of Goghat-I & II blocks, one in Tarakeswar Municipality and one in Kotalpur, Bankura area through active involvement of village level organizations. The livelihood of the people of this area is based on agricultural products. The land of this area is more fertile and suitable for all types of agricultural crops throughout the year. In view of helping and catering awareness of the local and adjacent farmers of this area with scientific knowledge, maintenance of soil health, modern technology, integrated/organic farming and all round development related with the agricultural products, the Krishi Mela is being arranged every year since 2012 and the fair becomes very popular. 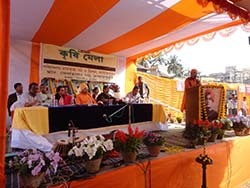 The integrated nutrient management/ organic farming components like, Vermicompost, Green Manuring, Leaf Manuring, Bio-fertilizers, Azolla and Bio-/Botanical-Pesticides are produced and demonstrated to the farmers in Krishi Mela at practical field after use in agriculture in Ramakrishna Mission Kamarpukur along with the results.